This being the first entry of my new blog, I decided I should start out by writing about something new – a camera… the Sony F65. In the crowded field of digital cinematography cameras, this is Sony’s latest entry aiming at the top of the class. It comes with what is being described as an 8K sensor, though, technically, it is really a 4K sensor with an additional 4K of green channel (luminance), which is being down converted on the fly to a 4 K signal. Whichever way you look at it, that’s a lot of pixels and considerable sensitivity. I was lucky enough to work with the Sony F65 under perfect conditions for seeing what the sensor can do, when I shot second unit photography for Michael Barrett on his film No Good Deed. Though he may not have been the very first DP to use the F65, he is definitely on the forefront and, I believe, his film will be the first F65 originated film to be released in theaters. What made No Good Deed such a good test case for the F65, is that the whole film, directed by Sam Miller and starring Idris Elba and Taraji Henson, takes place in the course of one rainy night and thus tests the camera’s ability to capture very low light and resolve visual obstruction. 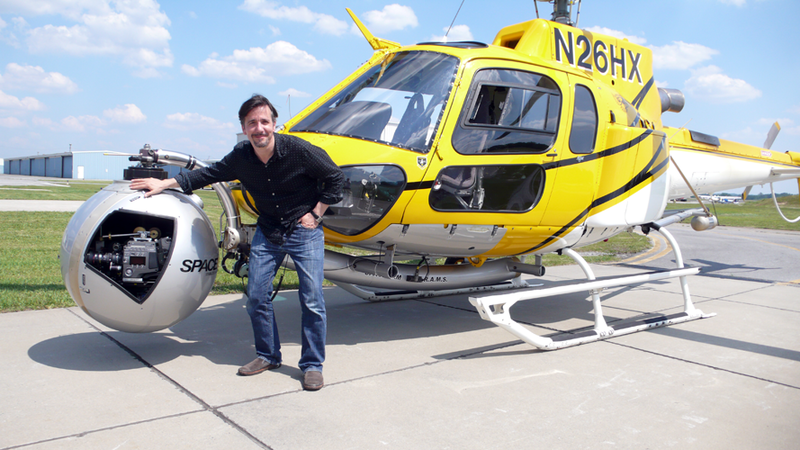 I also had opportunity to take an F65 up in a helicopter and shoot aerials with a Spacecam gyro-stabilized mount. 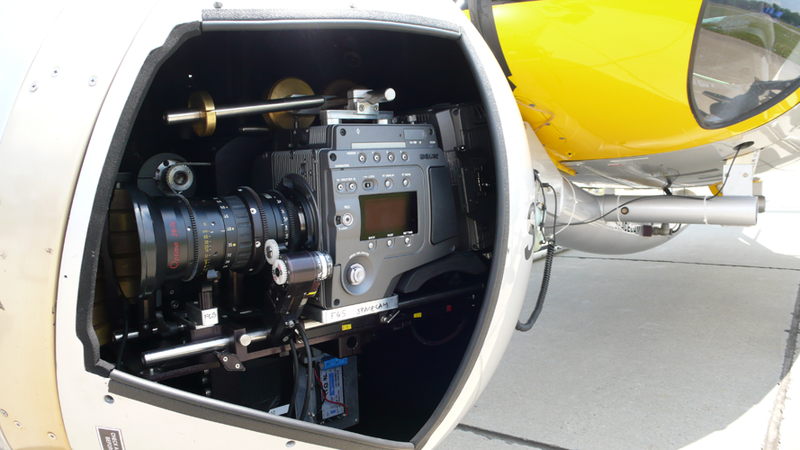 (Note: The F65 is somewhat larger than Sony’s predecessor the F35 and will fit only into two gyro-stabilized mounts on the market. Pictorvision’s Eclipse and Spacecam, though even Spacecam places limits on the lens size and only Eclipse can accept an F65 with a 10:1 or 12:1 zoom lens.) The aerial scenes, unlike most of the rest of the movie, were shot with daylight. The first thing that blew me away about the F65 was the media. The camera accepts a 1TB card about the size of your iPhone, which can write uncompressed 4K footage in real time. (If it weren’t for the $6,000 price tag, it would be useful to always carry a handful of those around with you.) Not being tethered to a recorder when shooting full resolution is a definite advantage over Arri’s Alexa, which, once you decide to go to full resolution nearly doubles the camera budget with the addition of Codex recorders and mags, not to mention the necessity to hire a lab or rent a (also pricey) Codex Lab for your shoot to do the down-conversions and trans-coding. The only time a tether would have actually been helpful was in the helicopter, where having the record deck inside the ship would have allowed for reloading in flight. However, with a record time of 30 minutes per 512 GB card (that’s what we carried – the 1TB cards have a record time of 60 minutes), our refueling stops and camera reloading synched up quite nicely. The A-Star helicopter could actually take on more fuel for more flight time, but with the 600 pound weight of the Spacecam mount and 4 passengers, our fabulous pilot Alan Purwin (who I worked with when he flew me around a 100 foot radio tower with Jim Carrey on it in Cable Guy) preferred to keep the extra weight down as much as possible. The other impressive thing about the F65 is its size and weight. First Unit on No Good Deed was shooting mainly hand held, and the operators, Gary Jay and Ray Milazzo, incredibly managed to work long nights without ever wearing down or tiring. Judging by shooting hand held with the camera myself, I have a sneaking suspicion that they will make a lucky chiropractor a wealthy man some day. And then, of course, there is the image… Looking at the First Unit DIT Mike Degrazzio’s monitor set up, I literally had to do a double take and look into the direction the camera was pointing to see what it was looking at, because I hadn’t seen what was on that monitor before, when I looked at the scene. The amazing detail and the definition in the shadow areas was literally more than I could see with my naked eyes in the dark night exterior, and this is where the camera really shines. Rated at a native ASA of 800, the camera performs perfectly at 1250 and with Michael Barrett opening up the shutter – yes, the F65 also has a physical shutter, which can be adjusted and even turned off, if so desired – he was able to turn dark leafy greens at night into what could almost pass for daylight. The issue seemed not so much to have to add light, but to take light away. Walking onto the No Good Deed set on the night I arrived in Atlanta, I immediately noticed, that the biggest light outside the sprawling house creating backlight was a 2K. Inside, gaffer Russ Caldwell, managed with KinoFlos and Chimeras illuminated by regular light bulbs. Though, of course, some larger units are needed for night shooting, especially back lighting wide shots with rain, you can see where Executive Producer Glenn Gainor’s dream of shooting without a generator and plugging all the lights into regular household outlets is no longer out of reach. All of this, however, would be meaningless, if the images didn’t look fantastic, and that they do. The crispness of the 4K sensor is a sight to behold, and even looking at a monitor on the set, you can tell that the quality of the image is outstanding. While the sharpness may produce some problems – skin flaws, but make-up, too, become more visible than may be desired – it is also a delight when shooting aerials or rain, situations in which lesser resolution can frustrate the eye. Michael had chosen to shoot NGD with the new Leica Primes, which are also extremely sharp, and the combined resolution is so great that it cannot be easily filtered, because the filters themselves can become visible. I would advise anyone contemplating using the F65 to shoot tests, especially with make-up, and perhaps try out different optics. Michael Barrett had the great idea of combining the state of the art F65 with older, softer lenses on another picture and that is definitely something I would test as well. I’ll be honest and say that I am considerably biased towards Arri products (I have worked mainly with Arri cameras for 25 years) and love the look of the Alexa sensor. However, the Alexa extols a stiff price, both in terms of budget and logistics, when shooting in full (almost 3K) resolution. Even then, it doesn’t come close to the resolution the F65 now offers with an on-board recorder, so it gets harder to argue in favor of the camera, unless you are shooting only HD resolution. The Alexa sensor has to me a very pleasing look and I like that, unlike the F65, the camera isn’t made out of plastic, which still gives the F65, despite its heft, a little bit of the flimsy ENG feel of its great grand parents, but the F65 is clearly Sony’s best achievement and, even for Arri fans like myself, has become a top contender. The sensor offers enough resolution for VFX, for slight reframing in post (though no cameraman would advise it, producers do like the option) and is nothing short of spectacular in low light. With the ever-changing production tools out there these days, the F65 has taken a place amongst the top, perhaps the very top, of some pretty amazing cameras. Remember how not that long ago, people like George Lucas went around praising the F900 (even before the /3 upgrade) and tried to tell everyone that digital was here to stay. Well, it may have been here to stay, but anyone who shot with the F900 back then is already out of luck when it comes to 2K and can surely deposit their tapes in a trash bin, when our televisions become 4K in the not too distant future. In that short time however, we have moved from F900s, which you can’t give away anymore, to F65s, which seem a lot more future proof to me. A sign of which was the recent Otto Nemenz equipment auction, in which the first camera rental house to have the F65, tried to divested itself of the F35s it had bought only a few years ago. They weren’t able to auction off every single one, which is as much as sign of the change as the fact that they tried it in the first place.